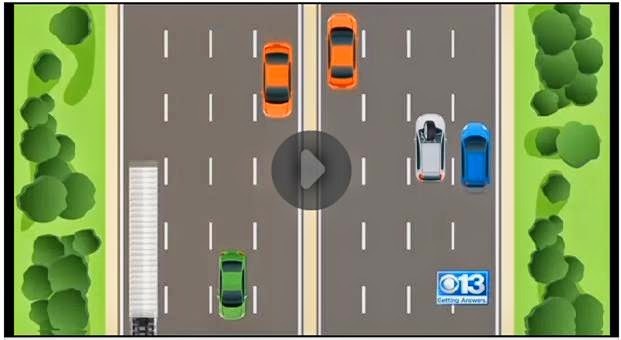 It was a freak accident on Interstate 5 that put a man who recently moved to Sacramento, CA on his deathbed. A big rig tire flew off a trailer and through Kyle Hubbard’s windshield on Feb. 14. He died over the weekend from his injuries, and the California Highway Patrol now says the driver of the trailer could face criminal charges. It’s one of those stories that leaves you thinking what are the odds. Hubbard was driving northbound on Interstate 5 near Sutterville Road when a trailer heading south hauling a prefabricated home lost a wheel that somehow ended up smashing through the 31-year-old’s windshield. When the tire flew off the trailer’s passenger side, it had to cross every southbound lane, the concrete median and two more northbound lanes before hitting Hubbard’s Ford Taurus. He suffered major head injuries, and after more than a week in the hospital, he died over the weekend. The CHP says it’s true that Hubbard couldn’t avoid the tire, and investigators are checking the trailer for any possible negligence. Depending on the findings, charges could be filed all the way up to involuntary manslaughter. The big rig and trailer are owned by Ernie’s Mobile Home Transport out of Olivehurst. Under the advice of an attorney, they had no comment. The CHP says a female passenger who was traveling to work with Hubbard was not injured in the freak accident. Actually the same thing happened to my parents in Knoxville when a wheel on a semi trailer crossed the concrete median wall and impacted the left just behind the driver's seat and damaging the rear left of the SUV. Luckily my parents were shaken but not hurt in this freak accident. Same thing happened to a DeLuxe trailer on I-83 near York, PA several years ago. Guy died in that one too. I think there was an accident very similiar to this in New Hampshire last fall.